A new infrastructure plant and data center have been inaugurated in Beirut, aligning LAU with the latest technology to address the growing power demand. Providing such state-of-the-art infrastructure systems and services is mandatory for fulfilling the academic mission of the university, says Jabbra. A complex and impactful project has been finalized by LAU as part of its efforts to address the growing power demand, enhance the existing facilities, ensure the latest technology and provide advanced high-quality services to the LAU community. 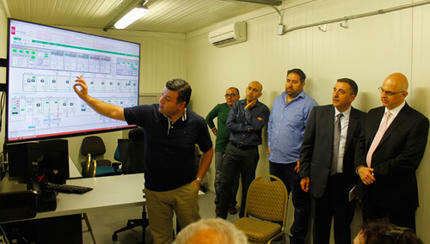 The official inauguration of the Beirut Campus Infrastructure Plant and Main Data Center took place in the presence of the Facilities Management and IT teams, LAU President Joseph G. Jabbra, the project’s consultant Pierre Dammous & Partners (PDP) and the project’s contractor Saccal Enterprises, among others. With the completion of this project, LAU acquires a fully-automated 7,000 KVA power plant including a redundancy of 2,000 KVA feeding the campus facilities through an underground medium voltage loop cabling system. The newly developed Data Center conforms to the highest standards and requirements for redundancy and availability, meaning a fault tolerant site infrastructure with electrical power storage and distribution facilities guaranteeing around 99.99 percent availability. Indeed, the high-tech computerized operation and monitoring of the load and power management not only guarantees better service to the university but also benefits the general community, thereby reasserting LAU’s commitment to being a leader institution. “LAU has built a state-of-the-art electrical infrastructure and tier-3 data center that support excellence in teaching, learning, research and administrative processes,” says Roy Majdalani, vice president of Human Resources and University Services. “This also allows our students, faculty, and staff to prosper within a first-class institution of higher learning.”An even more ambitious project was initiated at the Byblos campus in December. The result will be a centralized system encompassing a chilled water plant, a central power plant, a filtration plant, a major water tower with a capacity of 3500 cubic meters and a water treatment plant. Upon completion, scheduled for summer 2017, the new centralized system will enable the Byblos campus to operate at unprecedented efficiency levels.